Eliminates many hazards. No hammer blows. No chisels. No flying wedges. No sparks. Simply apply pressure to ratchet handle after "Safety Boy" Tool is positioned on flange...it is that easy. Use "Safety Boy" for the really safe way to drastically reduce downtime. Saves energy loss by allowing repairs to be made quicker. Eliminates hazards of leaking flange gaskets by using "Safety Boy" for quick and easy removal of defective gaskets and the replacement of new gaskets. "Safety Boy" is lightweight, easy to carry. Easy to assemble. Ready to operate in seconds. Can be operated with ease, even in cramped quarters. Easy to use. 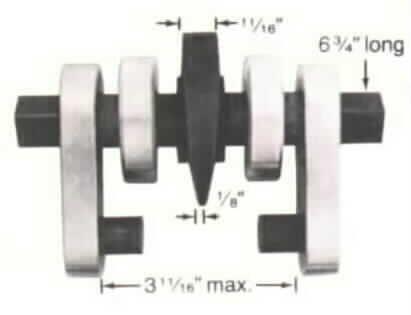 Pressure applied to ratchet handle forces circular cam wedge between flanges to make the separation. All models reasonably priced for wide usage on pipelines, in refineries, chemical plants, food processing plants, utility companies, in hospitals, on ships...wherever there is piping maintenance. 1. Remove one flange bolt and securely anchor Safety Boy tool. 3. Apply pressure to ratchet handle to force circular cam wedge between flanges to make flange separation. 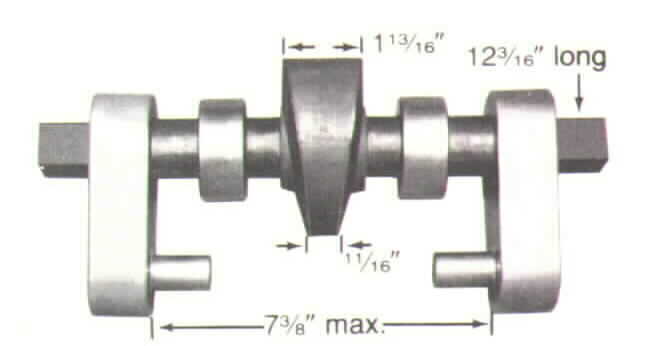 300# Flanges through 6" pipe size. 300# Flanges 26" through 42" pipe size.